Well-drained soil with compost dug in. Soil pH range of 5.0 to 7.0 is preferred. Honeyberries grow best in locations that receive a half day of sun, preferably in the morning. They grow well in partial shade along a woodland edge. Honeyberries can tolerate cold to -40F (-40C), so they are among the most cold-hardy small fruits you can grow. Cultivars descended from Russian breeding lines bloom and bear earlier than Japanese types, which are often called haskaps. These cold-natured plants seldom produce well in climates where summer temperatures often rise above 85F (30C). Agastache, Snapdragon, Comfrey, Chives and Poached Egg Plant. Plant in spring, just as the plants are emerging from dormancy. Mulch after planting to keep the soil cool and moist. Use wire cages to deter feeding by rabbits. Often called edible blue honeysuckle, honeyberries produce fragrant white flowers in spring, at about the time strawberries bloom. Two compatible varieties are needed for good pollination. 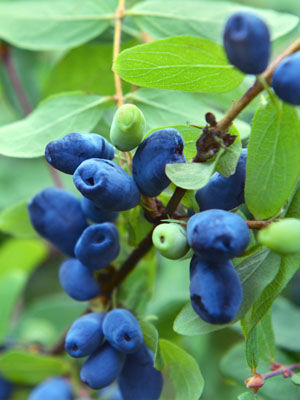 Wait until the fruit is blue inside to harvest, because berries picked too soon taste tart. Fully ripe berries have a complex blueberry-raspberry flavor, with a hint of black currant. Honeyberries are easy to freeze, and they are great for making jams or wine. Birds love honeyberries, so plan to defend your crop with bird netting or other covers. Sun scald of leaves is a risk when plants are grown in full sun. Healthy plants that do not set fruit may need a pollinizer variety planted close by to insure good pollination by insects. Supercharge Your Soil This Spring!